Episode 81 of the podcast features a discussion about the astrological outlook for July of 2016, with astrologers Austin Coppock and Kelly Surtees. This month begins just after Mars stations direct in Scorpio after a long retrograde period, lunations in Cancer and Capricorn, the heliacal rising of Mercury and Venus in Leo, and Uranus stationing retrograde in Aries at the end of the month. We begin with some news and announcements at the top of the show. ISAR is giving out an award for the best audio-visual production at their upcoming conference in October, and there is an open call right now for nominations. Evidently this includes podcasts. The initial phase is that the top five productions that get the most nominations before the deadline on June 30 will then be voted on by the general ISAR membership later this year. If you would like to nominate The Astrology Podcast then you should send an email to Glenn Perry at glenn@aaperry.com saying that you would like to nominate the podcast and giving them the link to it. Please CC Sam Reynolds on the email at: unlockastrology@gmail.com. If the podcast gets enough nominations in the next few days then it could win an award, which would be kind of cool. There is an open call for new speakers for the upcoming United Astrology Conference in Chicago in May of 2018. If you haven’t spoken at a UAC before, then this is your chance to apply. You have to send in a recording of an example lecture that you have given. Deadline is July 31, 2016. We are doing a giveaway at the end of the month for patrons of the show, and the prizes include a one year subscription to The Mountain Astrologer Magazine, and a pass to the upcoming ISAR astrology conference in California in October. For more details see the giveaway description page for June. This is the last chance to sign up! We will be announcing the winners on the next episode, which is being recorded on Wednesday. New Moon in Cancer on July 4. Venus ingresses into Leo July 12. Mercury ingresses into Leo July 13. Mercury and Venus heliacal rising in Leo. Full Moon in Capricorn July 19. Sun ingresses into Leo July 22. Uranus stations retrograde July 29. 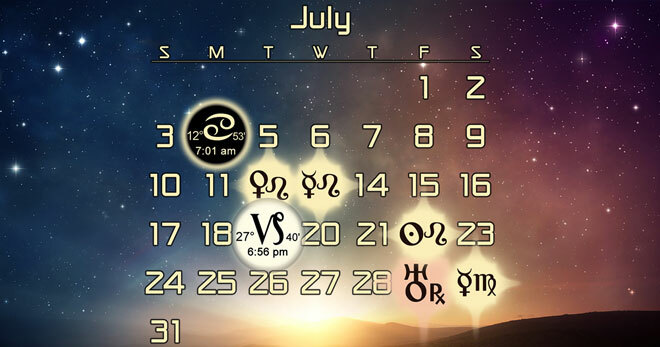 Mercury ingresses into Virgo July 30. In the same idea of seeing coming this Saturne/Neptune square years ahead, it would be nice to talk about Saturn entering Capricorn, and then moving into Aquarius, with Jupiter catching on, as it’s maybe the next huge thing that will shape the next 30 years. The last time Saturn was in Capricorn, we had the fall of Berlin wall. I thought that both the U.S. Democratic race as well as the NBA Finals had an air of that Saturn/Neptune square. Both governing bodies (DNC and the NBA) seemed to deceptively play with the rules a bit in an attempt to “guide” the outcomes of both events. Both deceptions were such thinly veiled efforts that it was like professional wrestling (with foils and heroes and upstarts, etc.). I am biased, but I don’t think I am alone in my conspiracy theories. Hesitant to say that I’m glad June is over! Really enjoying these monthlies. Not sure about the new inline adverts for the sponsors. Thanks Chris, Kelly, and Austin! Yeah, I was testing out something I read about in podcasting called doing “live reads” with the advertisements, as I thought it might allow us to work them into the conversation more naturally rather than just taking 10 minutes at the top of the show to do them. Not sure that it came off much better though, so I may just go back to doing them at the top of the show. We’ll see how it goes, as even having sponsors is still kind of a new thing that I’m experimenting with. Thanks for your feedback!